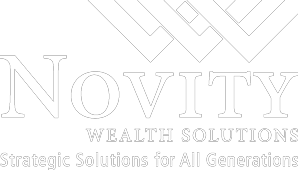 Novity Wealth consists of individuals that have a strong focus on the planning process and a belief that a team approach provides the greatest value to you, our clients. We work as a team to help develop plans and strategies regarding business transition, retirement, risk mitigation, wealth management, and efficient estate transfer*. Leveraging our more than 100 years of collective financial services experience enables us to fulfill our promise to take on clients for life. We help our business clients remain competitive by providing comprehensive guidance in the areas of risk and wealth management, while accommodating the personal financial needs of the employees and families that drive their success. We serve as a valued and knowledgeable resource for our clients by analyzing current plans and creating new plans, as well as offering group benefits in the areas of health insurance, retirement, and other insurance products, such as life, long term care, and disability income protection. From starting a family, to building a business, to planning for retirement, we work to help you reach your personal and business goals throughout every stage of life. As always, we leverage our collective experience, evolving our best practices to incorporate industry advancements and new technology to ensure we deliver state-of-the-art solutions that help meet client expectations on every level. We now have offices across western and upstate New York with a team of more than 10 financial services professionals. Click here to learn more about The Voss Group: www.thevossgroup.net. * Representatives do not provide tax and/or legal advice. Clients should confer with their qualified legal, tax and accounting advisors as appropriate. **Please note that Partners and Partnership references does not constitute a legal partnership relationship. The Voss Group and Novity Wealth Solutions are not subsidiaries or affiliates of MML Investors Services, LLC, or its affiliated companies.